>The most exotic place you can reach within three hours of the UK is a mesmerising mix of culture, cafés and souks. It’s spring, so the days are warming up and the skies are clearing. And peak season for visitors to this fascinating ancient city is still a month or two away. You can fly from Gatwick or Manchester on Thomson Airways (0871 231 4691; flights.thomson.co.uk ) or easyJet (0905 821 0905; easyjet.com ); from Bristol, East Midlands, Edinburgh or Luton on Ryanair (0871 246 0000; ryanair.com ); from Gatwick on British Airways (0844 493 0787; ba.com ) or Royal Air Maroc (020-7307 5800; royalairmaroc.com ) and its no-frills subsidiary Atlas Blue. The newest route in addition is BMI from Heathrow to Marrakech, flying on a Sunday, Wednesday and Friday. The main attraction – the Medina – is the oldest part of town. Centuries-old planning permission allows just one building to stand high above the rest: the minaret of the Koutoubia Mosque (1). To the west of the Medina is the Nouvelle Ville, created by French colonists. Here you’ll find some great restaurants, boutiques and the tourist office (2) on Place Abdel Moumen Ben Ali on Avenue Mohammed V (00 212 524 43 61 31; marrakech.travel ) open 8.30am-4.30pm Monday-Friday. To the north-east of the “old” and “new” parts of the city is the Palmeraie – a place of palm trees, big hotels and private villas, best explored on camel or horseback. Marrakech’s Menara airport is just 6km south-west of the city centre. Expect to pay 100-150 dirhams (Dh), about £8-£12, from the airport to the Medina and 200-250Dh (£16-£20) to the Palmeraie – two or three times the “official” fares. Surprisingly you’ll get a slightly cheaper ride if you opt for a “grand taxi” rather than a “petit taxi”. The grand variety tend to be 25-year-old Mercedes; the petit taxis are usually Peugeot 206s. The airport shuttle bus departs every half-hour, for a fixed fare of 20Dh (£1.70) single/30Dh (£2.50) return. It deposits you at all the key places in the city, including the main square in the old town, Djemaa el Fna (3), and the biggest roundabout in the New Town, Place du 16 Novembre (4). 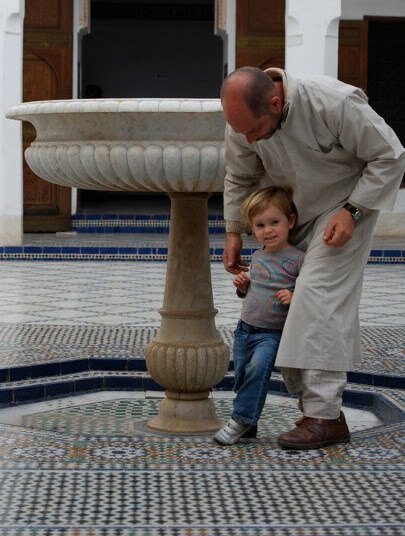 Ideally, every visitor to Marrakech should stay in a riad: a traditional family house authentically restored for the traveller. A top-of-the-range example is the Riad El Fenn (5), at 2 Derb Moulay Abdallah Ben Hezzian, Bab El Ksour (00212 524 44 12 10; riadelfenn.com ). Five minutes’ walk from the main square of Djemaa el Fna (3), down a half-built alleyway and behind a very ordinary looking door, you find luxury on an opulent scale: heavenly bedrooms, serene courtyards, fountains, roses and the odd wandering tortoise. There are 21 rooms and suites to choose from. Doubles start at 3,000Dh (£250) including breakfast. 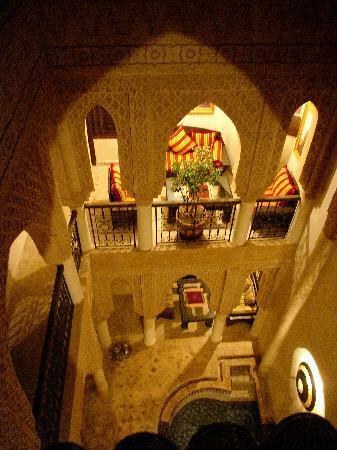 For travellers on a budget the riad experience is still an option. Try Riad Laksiba, at 16 Derb Kadi, Bab Ksiba,(0044 7850 390 107 ; www.laksiba.com ) situated in the popular Kasbah quartier of the Medina, styled and restored in a very apt’ “old Palace” style and offeres comfortable 5 Bedroomed B&B facility. All rooms are Twin bedded, some “pushed together”, dependant on preference, at 780Dh (£60) per/room including Breakfast represents excellent value for money and can be rented as a whole from 6 to Max 10 people on discounted rates. At the km6 point on Route Fes you can find space and Marrakech’s largest swimming pool at Club Hotel Riu Tikida Palmeraie (6) (00212 524 327 400; riu.com ) – a hotel so new they’re still planting palm trees in its gardens. It’s a great location if you want to dip an occasional toe into the vibrant circus of humanity contained within the red earth walls of the ancient city; a 15-minute shuttle-bus ride takes you to the city centre. Thomson (0044 871 231 4691; thomson.co.uk ) has one-week packages including flights from Gatwick and transfers for under £600 per person. sense-assaulting main square, Djemaa el Fna (3), is an obvious place to start the day. But a counter-intuitive approach is to kick off north of the square and its markets and work your way down. Here, centred on a more modest square, Place Ben Yousseff (7), are three buildings to give you an insight into the history and culture of the city. A single 60Dh (£5) ticket will get you into them all, which share the same hours (daily 9am-6pm, from April to 7pm) and contact details (00212 524 44 18 93 ; museedemarrakech.ma ). Start with the medersa (8), the religious school next to the Ben Youseff Mosque and one of the few Islamic buildings open to the public. The mosaics, cloisters, cupolas and arches are 16th-century masterpieces. 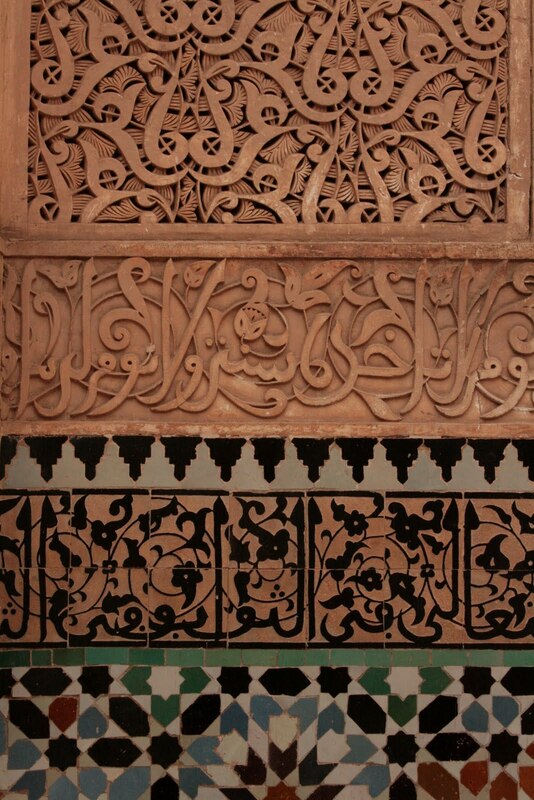 Move on to the Museum of Marrakech (9), an early 20th-century palace offering temporary exhibitions of modern art and permanent displays of Koran manuscripts, coins, ceramics and textiles. And the last exhibit on your all-in-one ticket: Quabba Ba’Ayin (10), a well-preserved 12th-century dome. There are dozens of eating opportunities as you get deeper into the souks, but if you want some respite outside the Medina, it’s worth tracking down the Café du Livre (11) at 44 Rue Tarik Ben Ziad (00212 524 43 21 49; cafedulivre.com ), which opens 9.30am-9pm daily except Sunday. It is hard to find, hidden behind a building site and tucked away in a courtyard. Yet it is popular with students thanks to free Wi-Fi, good food and a good selection of books for sale into the bargain. A tasty salad costs 75Dh (£6.25), while a spicy bowl of Moroccan soup costs 40Dh (£3.40). of a covered market area spreading out into a mass of confusing lanes, alleyways, passages and small squares, guaranteed to outwit the most spatially aware visitor. A map won’t really help you here, but a friendly smile and 10Dh (80p) tip to the many willing guides will get you to where you want to go. After you’ve passed the same emporia a few times you realise there is a system here – of sorts. 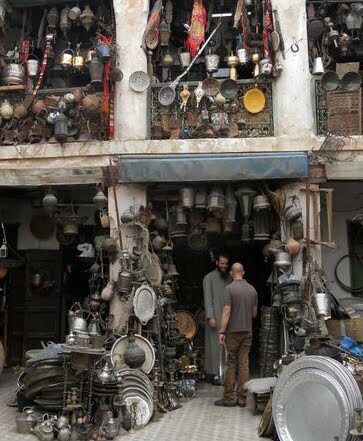 The shops tend to be grouped together by trade: herbs and spices in one area, leather and weaving in another, pottery, metalwork, jewellery, lamps and mirrors somewhere else. Bargaining is expected; enjoy it: work out what you think something is worth, attempt to stick to that target and never walk away from a purchase once you’ve settled on a price. Alcohol is not permitted to be served within 150m of a mosque, so if it’s a stiff drink you need in the heart of Marrakech, head for Café Arabe (12) on Rue El Mouassine (00212 524 42 97 28; cafearabe.com ), one of the few bars that sells alcohol in the area. Enjoy a 35Dh (£2) glass of wine on the terrace with the Atlas Mountains as a backdrop. If being in the centre of the action appeals more than alcohol, head for one of the many cafés and restaurants overlooking the Djemaa el Fna (3), such as Les Terrasses De L’Alhambra in the north-east corner of the square (00 212 524 427 570). Sip tea on their terrace for one of the most fascinating views of all: of food sellers, henna-tattooists, snake-charmers, storytellers, musicians, tarot card readers and amazed tourists coming together for what looks like one big, early-evening rave. On the stroke of 6pm the food stall vendors in the Djemaa el Fna (3) appear from nowhere and spring into action, setting up shop, putting up tables and chairs, laying out tablecloths and getting their grills going. The square becomes a haze of barbecue smoke and smells. Try stall number 32 where a plate of kefta (lamb meatballs) or merguez (spicy red sausage) will cost you 18Dh (£1.50). For an exclusive, more intimate Moroccan feast, away from the party atmosphere, try Le Tobsil (13) at 22 derb Moulay Abdallah Ben Hessaien, Ksour (00212 524 44 40 52). Do book: it’s deservedly very popular. For a fixed price of 600Dh (£50) you get the full banquet: vegetarian mezes, tajines (stews), couscous, delicious desserts and a choice of Moroccan wines. It’s a spread best appreciated when very hungry after a day of sightseeing. The best public garden to explore is the Jardin Majorelle (14), north of the Medina in the new town on Avenue Yacoub El Mansour Marrakech (00 212 5 24 31 30 47; jardinmajorelle.com ). It was created by the French painter Jacques Majorelle in 1924 and opened to the public in 1947. Here, amid the palm trees, the cacti, the cobalt blue and bright, bright yellow planters, you’ll find a memorial to the late fashion giant Yves Saint Laurent. He took it over in the Eighties and preserved it until he died in 2008; his ashes are said to be spread here. It opens 8am-6pm daily, admission 30Dh (£2.50). Within the gardens stands the Musée d’Art Islamique, though sadly it is currently closed for renovation until the summer. A more natural green space can be found in the Menara Gardens (15) on the Avenue de la Menara, open 8am-7pm daily, admission free. It resembles one big olive orchard broken up by a huge rectangular pool with a 19th-century pavilion situated on one side. Viewed from the opposite side of the pool you’ll find yourself looking at an oft-used postcard shot of the pavilion set against the Atlas Mountains. The Menara Gardens (15) is a popular picnic spot for locals, but if you’re after comfort head back into the New Town, and on the corner of Boulevard el-Mansour Eddahbi and Avenue Imam Malike you’ll find Le Grand Café de la Poste (16), a former sorting office that became a French colonial hotel and which has now been restored and operates as a wonderfully chi-chi café-brasserie (00212 524 43 30 38; grandcafedelaposte.com ). Salads start at 90Dh (£7.50) and omelettes at 70Dh (£5.80) Open daily 8am-1pm. Back in the old town, venture south of the Djemaa el Fna (3) to the kasbah, or royal quarter, an area with more space and more light. This is where you find the king’s palace (17) and two former royal residences: Palais El Badi (18) and the stunning Bahia Palace (19), a magnificent 19th-century residence which, despite being stripped bare, is still impressive with its woodwork ceilings, mosaics, patios and courtyards. Open 9am-noon and 3pm-6pm daily, admission 10Dh (80p). Head out to the Palmeraie and get a grasp of the geography by going on a camel or horse ride. Once you get past the carcasses of half-built villas and hotels you can trek alongside shepherds and their sheep and feel you’ve gained an authentic view of the Moroccan countryside. A small outfit that can help you achieve this is Marrakech Cheval (00212 524 31 1771; baladepalmeraie.com ); 420Dh (£35) for a two-hour camel or pony ride with a guide, including pick-up from your hotel.